Bill Sinnott (Corporation Counsel for the City of Boston) spoke with PILP 10 last Thursday about his own career and offered helpful advice about their own career paths. Last week, the BBA’s Public Interest Leaders had the pleasure of meeting with the Corporation Counsel for the City of Boston, William Sinnott. As Corporation Counsel, Bill oversees all lawyers and legal matters for the city. With his previous experience as an Assistant District Attorney, Assistant U.S. Attorney and a decorated retired Colonel in the Marine Corps Reserves, Bill was an excellent resource to the PILP’ers and is a prime example of leadership and service to the community. The meeting gave the class the opportunity to both learn more about Bill’s unique career path, as well bounce ideas off of him as they start to brainstorm on their own programming initiatives. Stay tuned for more updates on PILP and what this class has in store for the year ahead. BBA volunteer attorneys offered Coast Guard personnel and their families legal assistance at a Yellow Ribbon event in Quincy last Saturday. As you know, the BBA is dedicated to addressing the legal needs of our military personnel, veterans, and their families through programs such as Yellow Ribbon Events and the Military Hotline. In light of that, Beyond the Billable thought this BBA Week article would be of particular interest to our readers. The article highlights two of the volunteer BBA attorneys who provided legal assistance to the 250 Coast Guard personnel at the pre-deployment Yellow Ribbon event in Quincy. 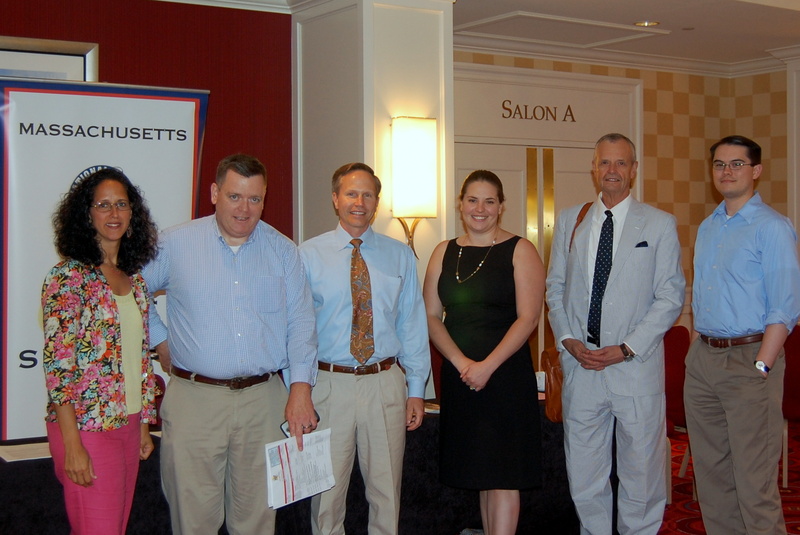 For more information on how to get involved in the BBA’s Veteran’s Initiative, please contact Katie D’Angelo, Public Service Programs Coordinator, at kdangelo@bostonbar.org. 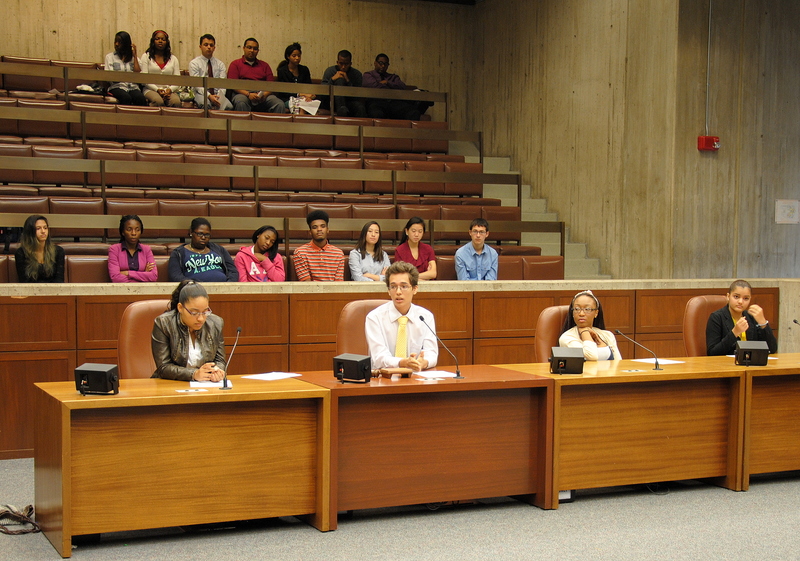 The Summer Jobs students participated in a mock City Council meeting this morning. 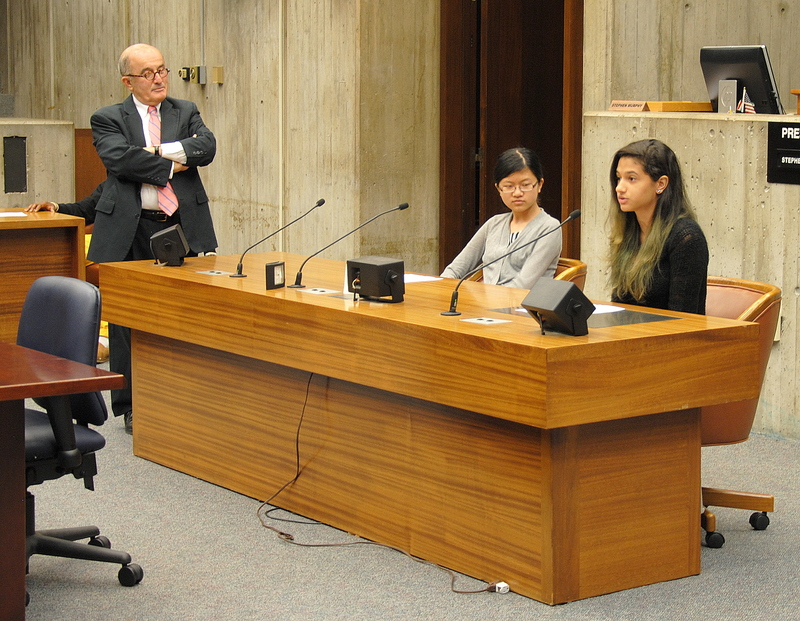 This morning, an ordinance filed by the Mayor about a curfew for young people under the age of 17 was hotly debated in the Boston City Council Chambers. The Commission on the Affairs of the Elderly, the Association of Main Street Businesses, the Mayor’s Youth Council, and Pediatricians for Peace presented their positions to the City Council Committee, which after deliberating, voted against the curfew for teenagers. After the seminar, Beyond the Billable caught up with a couple of students after the session to hear about their experience. 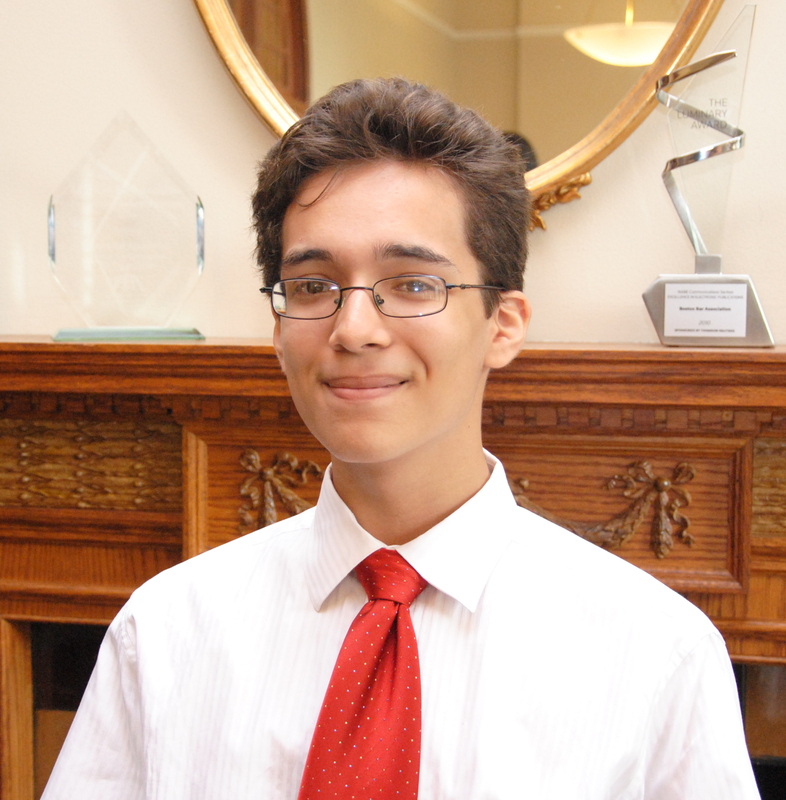 David Lozano, a rising senior at Boston Latin Academy and intern at Nixon Peabody, played the Council President. “I think it was really cool to use the room. Even if the mock City Council meeting was not real, it is a good representation of what really happens. Debating the issue showed that City Council’s decisions aren’t based on one person’s position but that decisions are based on a lot of deliberation. 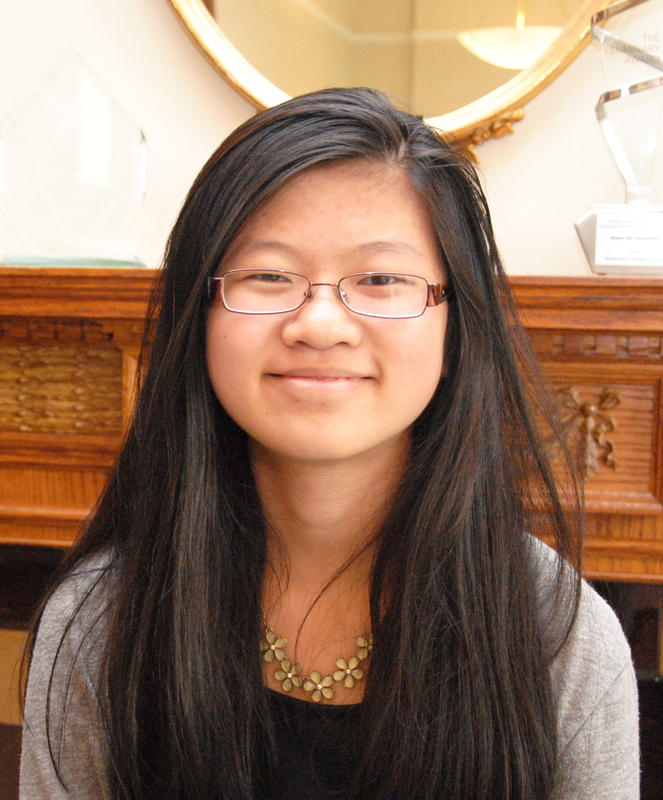 Julia Pan, a rising junior at Boston Latin Academy and intern at Edwards Wildman Palmer LLP, provided a spirited performance as the representative for the Commission on the Affairs of the Elderly. Cynthia Peguero, a rising senior at Jeremiah E. Burke High School and intern at Shaevel & Krems, presented the position of the Association of Main Street Businesses to the City Council Committee. After hearing from the different interest groups, the City Council Committee discussed their opinions on the ordinance before voting. Next week, the students travel to another offsite enrichment seminar at the Supreme Judicial Court. The Boston Debate League teaches Boston Public High School students valuable skills, such as public speaking and critical thinking. Are you a former debater looking to get more involved in the community? Beyond the Billable has the perfect volunteer opportunity for you — the Boston Debate League (BDL) is seeking mentors for the 2013-2014 program year. As a mentor, you will attend a weekly, after school debate practice and work with debaters to cultivate public speaking, critical thinking, and analytical skills. So why get involved? Academic debate teams have a significant impact on the future of the participants. According to BDL, nearly 100% of students who participate in an urban debate league graduate from high school and more than 80% graduate from a four-year college. Beyond the Billable reached out to current BBA mentor Stephanie Hoeplinger for a firsthand perspective of this volunteer opportunity. What was your experience volunteering as a Boston Debate League mentor? Why do you think lawyers make good debate mentors? For more information on how to volunteer, please contact Katie D’Angelo, Public Service Programs Coordinator, at kdangelo@bostonbar.org. David Rozenson taught the Summer Jobs students about car loans and the cost of purchasing a car as part of the M. Ellen Carpenter Financial Literacy Program. This morning, BBA Summer Jobs students participated in “Buying a Car,” a module of the BBA’s M. Ellen Carpenter Financial Literacy Program. This module is just one session of the four part program, which teaches high school students about the importance of making informed decisions regarding their finances. The program has set records this year, reaching more than 1,300 students across Massachusetts. Here’s another incredible stat: the program provided financial literacy education to more students during the 2013 program year than it reached in all of its previous years combined, 2005-2012. This incredible growth is thanks to the BBA’s volunteers and the quality of its programming. 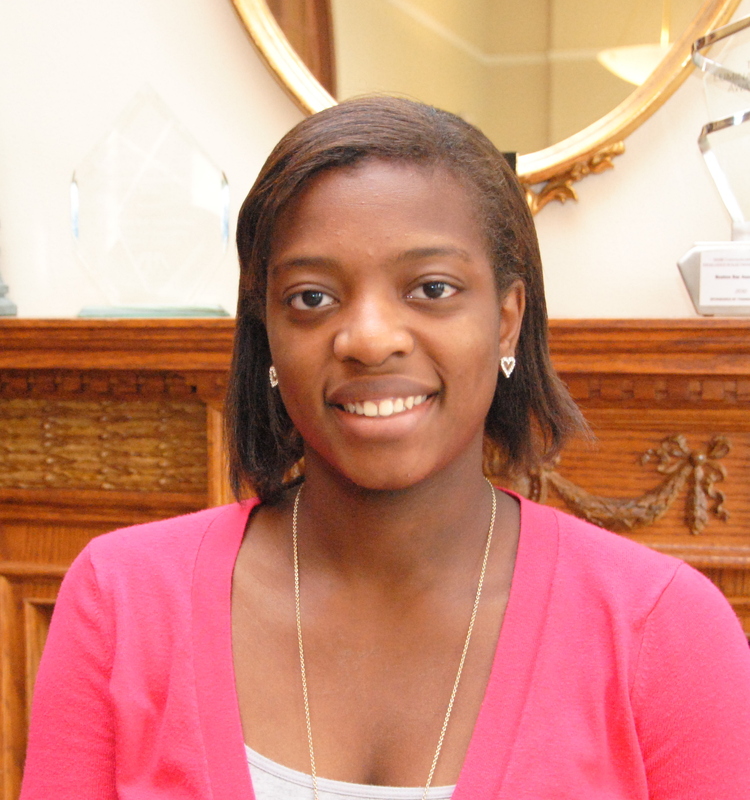 Raenelle Teesdale, a recent graduate of John D. O’Bryant School who is interning at Chu, Ring, and Hazel LLP this summer, has been thinking about buying a car. In mid-August, the Summer Jobs students will visit the U.S. Bankruptcy Court for the final module—Consequences—to learn about the repercussions of poor financial decision-making. 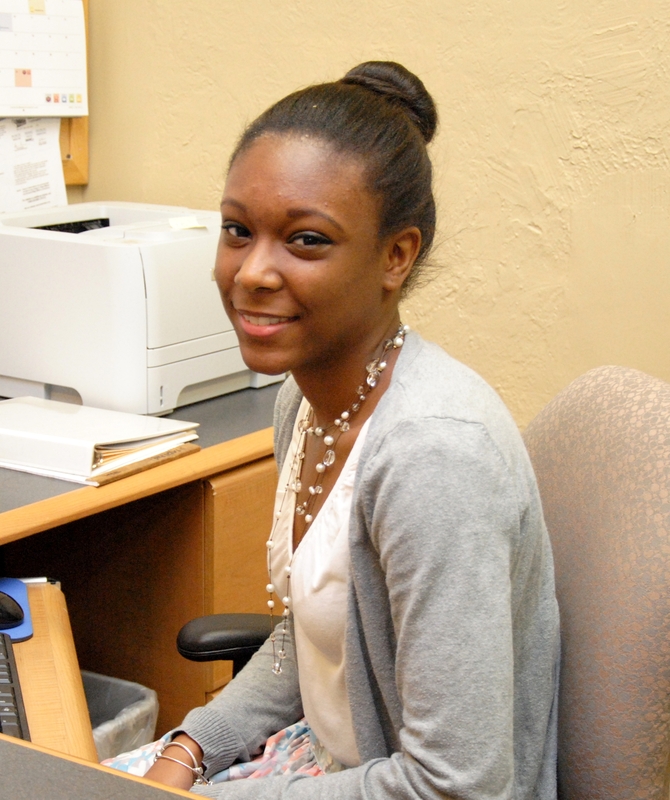 Alexandra Williams, a 2008 Summer Jobs alum, is interning with the BBA’s finance department this summer. After her sophomore year at Boston Latin School, Alexandra Williams landed her first office job as a summer intern at Holland & Knight through the BBA’s 2008 Summer Jobs Program. Now a rising senior at Georgetown University majoring in operations and information management, Alexandra again connected with the BBA to procure a summer job – but in a new role. She is interning with the BBA’s finance department this summer, compiling data for the Statewide Task Force to Expand Civil Legal Aid in Massachusetts launched by BBA President J.D. Smeallie earlier this year. Alexandra is yet another example of the lasting impact of the program on the students’ professional experiences—even outside of the field of law. After another legal internship, Alexandra decided that becoming a lawyer was not the right career choice for her. Nevertheless, the program helped prepare her for her future professional and academic endeavors by giving her confidence early in her career. For the record, Alexandra stills calls Holland & Knight her favorite job and highlighted the benefit of participating in the program’s enrichment seminars while working throughout the summer. After hiring Alexandra this summer, the BBA can personally attest to the quality of the students that the program produces. 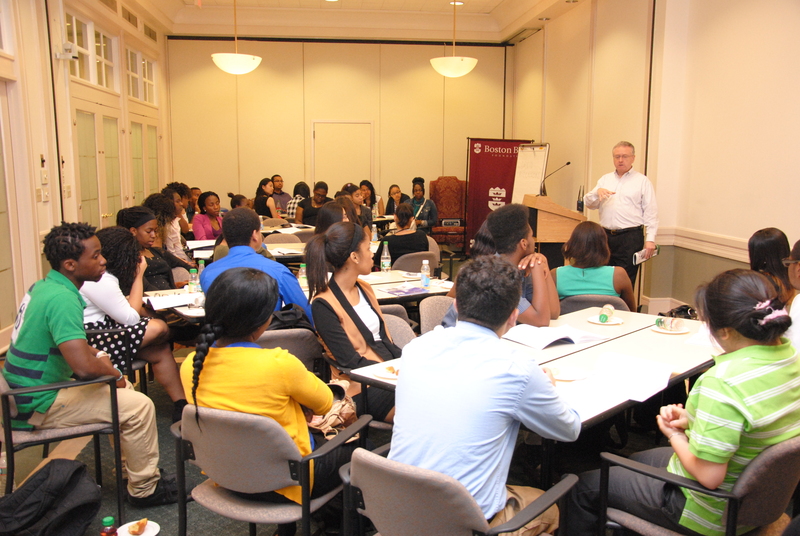 Dan Forster (Simmons College) discussed the financial aid process with the Summer Jobs students. After their first three days of work, the 58 Summer Jobs students returned to 16 Beacon for their first enrichment seminar on student loans. Daniel Forster, the Director of Student Financial Services at Simmons College, spoke with the students about the financial aid process, sources of aid, and how financial need is determined. The students had the opportunity to ask questions about their own financial aid packages and financial concerns. When asked why the segment was helpful, Allysha Pierre, a Summer Jobs student interning at Wolf, Greenfield, & Sacks and rising college freshman, explained that “you don’t know what you’re getting into when you go to college. 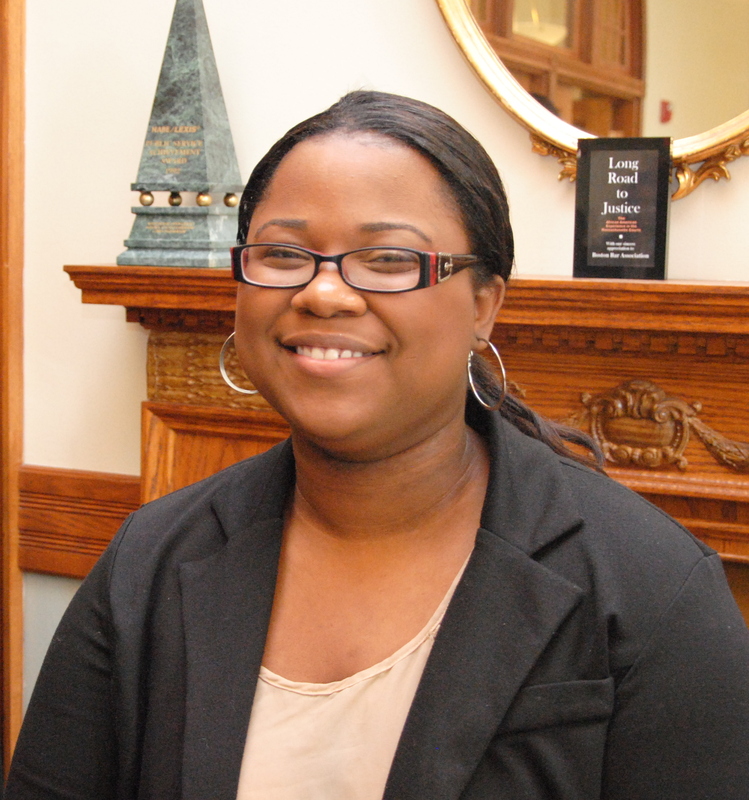 The more information you know about students loans, the better prepared you can be for the future.” After talking to Forster about her specific financial aid situation, she told Beyond the Billable that she feels better prepared to contact her financial aid advisor and discuss how to lower her unmet need. Like Allysha, many of the students in the program will be attending college in the fall or plan to attend after they complete high school. In combination with the financial literacy sessions, this seminar aims to prepare students to make educated financial decision about paying for their higher education. This past year, Christina Miller (Suffolk District Attorney’s Office) and Ed Gorman (Law Office of Ed Gorman) served as mentors for the group of Boston Public High School juniors and seniors who have been selected to represent their neighborhoods in the Mayor’s Youth Council. In their role as mentors, Miller and Gorman helped guide students thought their program goals and develop skills in various capacities including executing and leading meetings. 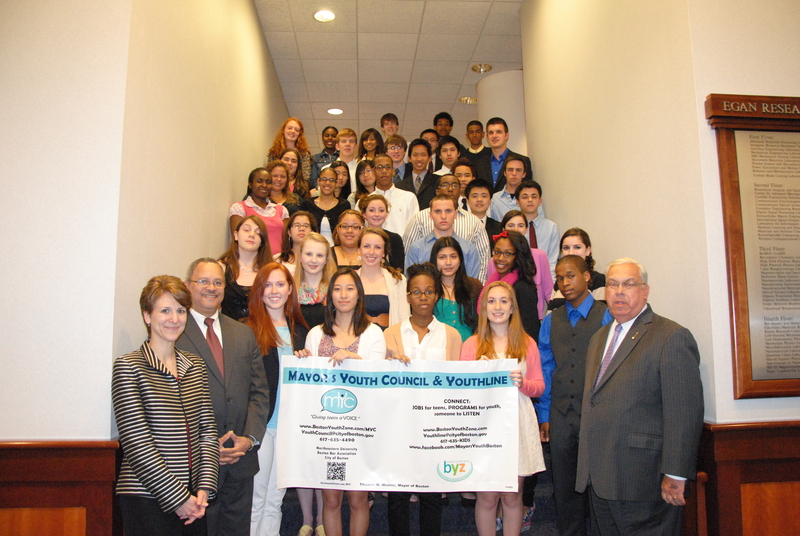 The BBA has co-sponsored the Mayor’s Youth Council with the Mayor’s Office and Northeastern University since 1994. The Mayor’s Youth Council, a partnership between the BBA, Mayor’s Office and Northeastern University, gives young people the opportunity to reach out to other Boston teens. 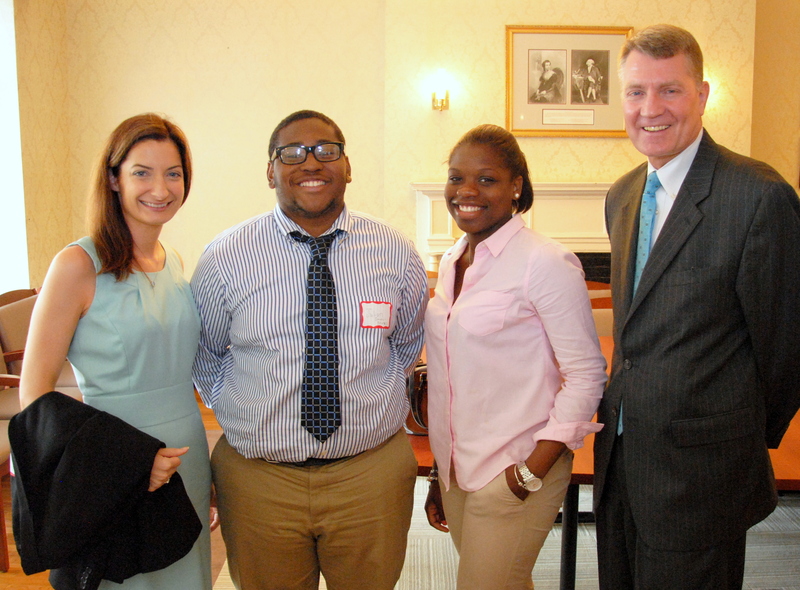 The BBA provides the Mayor’s Youth Council lawyer-mentors. 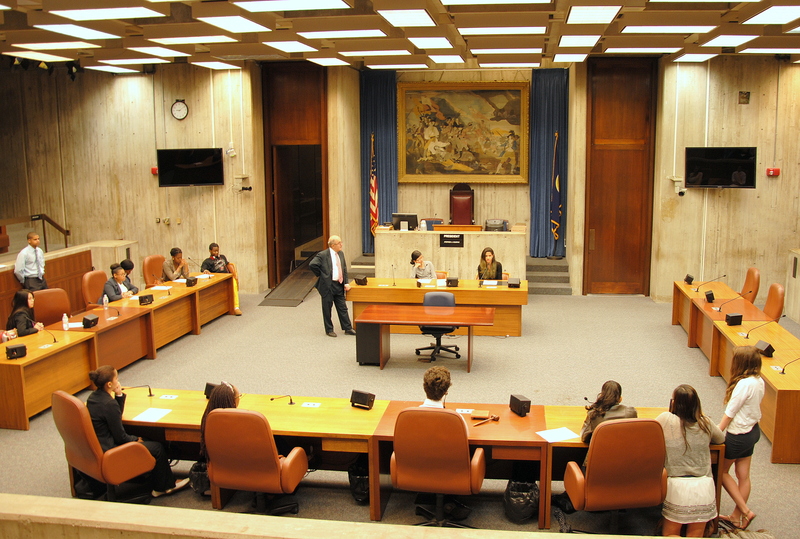 For more information on the Mayor’s Youth Council, please contact Katie D’Angelo, public service programs coordinator, at kdangelo@bostonbar.org. 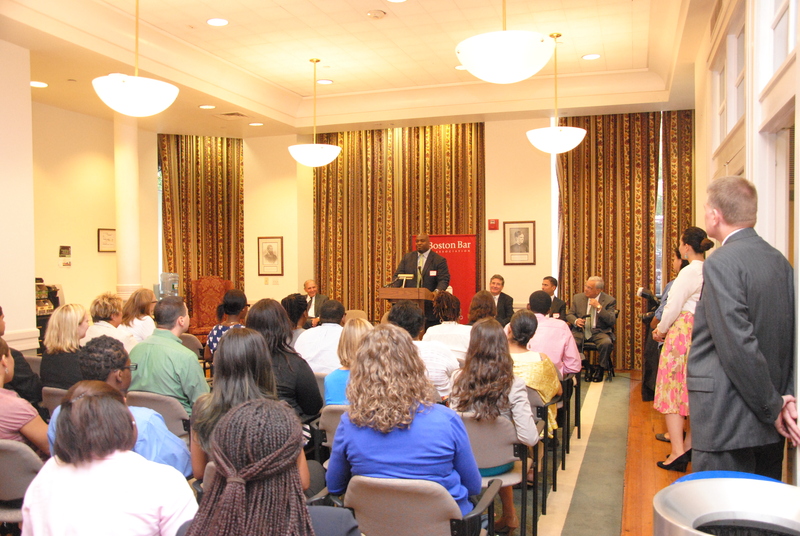 This morning, students, families, and employers packed into 16 Beacon street to hear from Mayor Thomas Menino and BBA leadership to celebrate the beginning of the 20th annual Summer Jobs Program. This year’s event marked an all-time high for the program with 58 student positions thanks to commitment from 41 firms and law offices. Highlights of the program featured a keynote speech by Tavares Brewington (Prince Lobel) encouraging students to find their vision and an award presented by BBA President J.D. 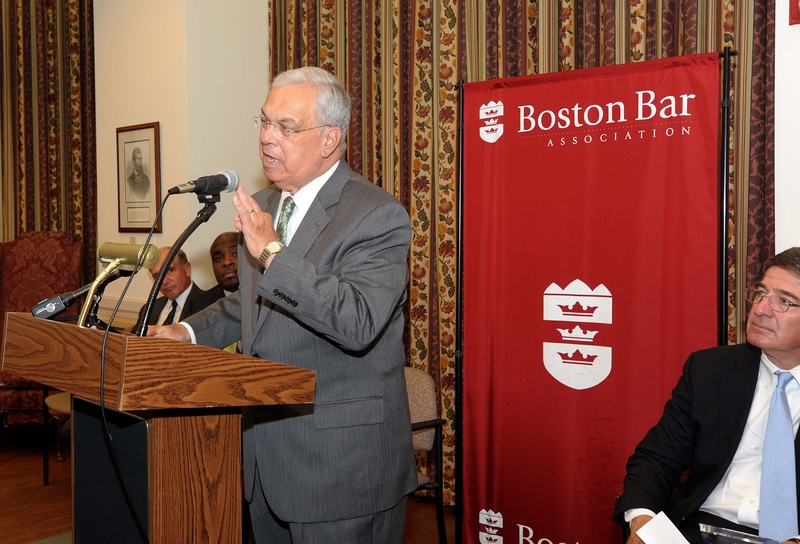 Smeallie (Holland & Knight) to Mayor Menino to honor the Mayor’s longstanding commitment to the program. Mayor Menino addressed the crowd of students, their families, and employers about the importance of this summer jobs experience. Tavares Brewington (Prince Lobel) discussed his own path, from South Florida, Western Mass, College of the Holy Cross, playing pro football in Europe, the US Attorney’s Office and Prince Lobel, while encouraging students to find their own vision and achieve it. Kharlita Chambers-Walker (Charlestown High School) and Julian Smith-Sparks (English High School) will be working at the City of Boston’s Office of Corporate Counsel. After the event, the students headed off to their first day of work. Please stay tuned for more on the students’ experiences throughout the summer. 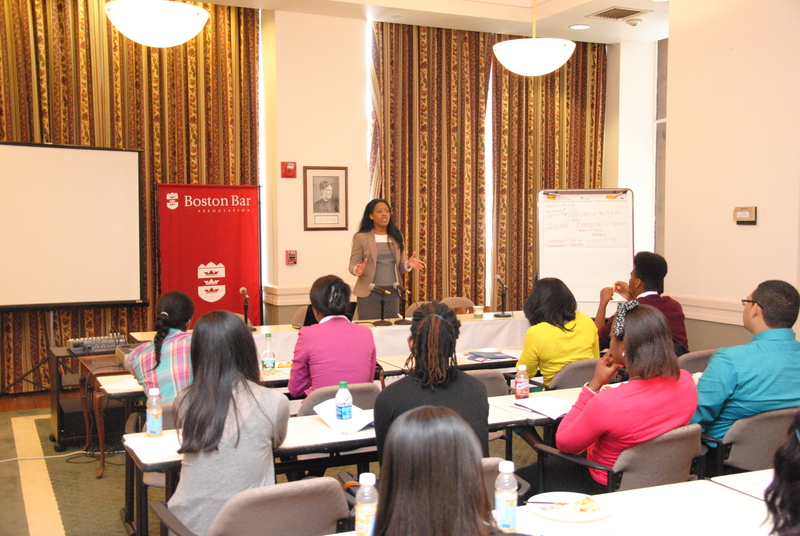 This morning, 58 Boston Public High School students traveled to 16 Beacon Street for the annual BBA Summer Jobs Program orientation. 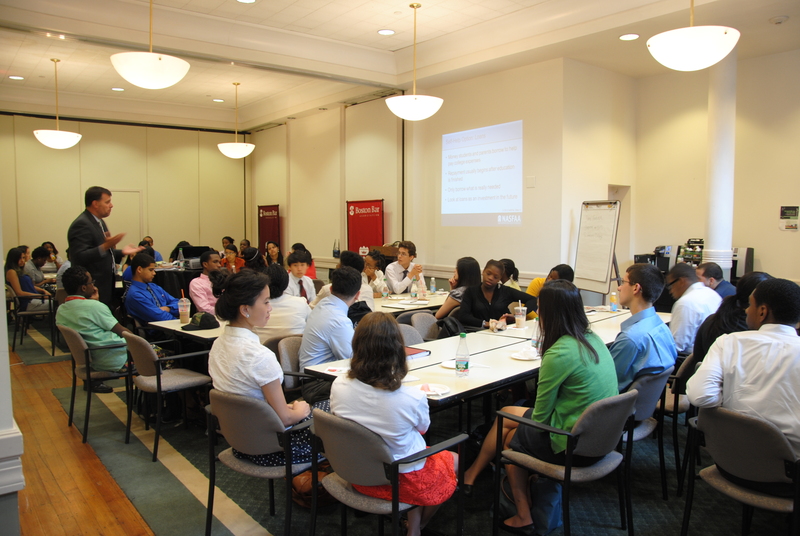 To help prepare students for their first day of work on July 8th, the orientation included sessions on workplace professionalism, as well as two financial literacy enrichment modules, on personal finance and budgeting and credit cards. 2003 Summer Jobs Alum Emmanuelle Renelique (Wilmer Hale) spoke with the students about her own experience as a Summer Jobs intern. Melissa O’Berg (Rocket Software, Inc) taught the Financial Literacy module on using credit and credits cards to the 58 Summer Jobs students. Please stay tuned for more highlights from the program throughout the summer. 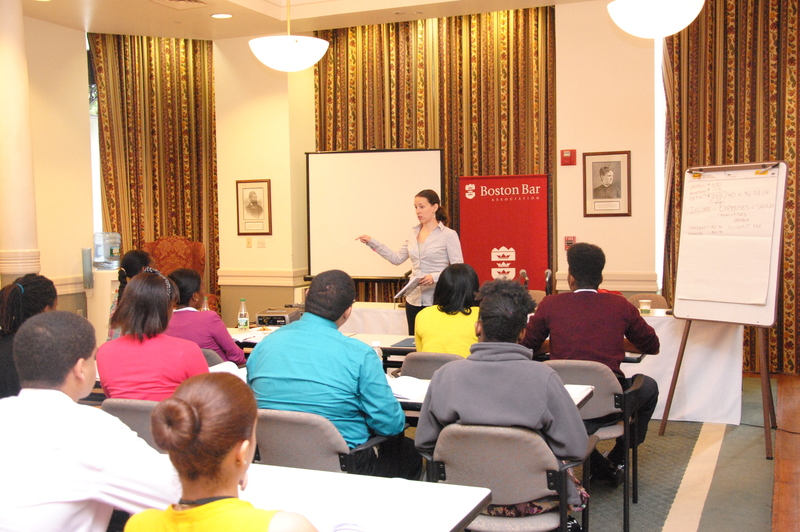 For more on the Summer Jobs Program, please contact Katie D’Angelo, public service programs coordinator, at kdangelo@bostonbar.org.